The kids are out of school (as of yesterday). I'm so proud of them both! They both got perfect grades and conduct (well Jake had satisfactory on self-discipline, but that's not a big surprise). Tomorrow is the big day of stitching at French Hen's with my friends and I can't wait!! It will be great to see everyone and it will be great to get away! The day after we're headed down to Florida for a few weeks. I got a very sweet package in the mail the other day from Andrea. I sent her a chart and she wanted to send me something in return. She sent a very sweet little snippet bag that her friend made, some chenille trim, scissors and candle. Thank you again Andrea! I love it all!! I have been stitching a little. I got Village of Hawk Run back out and finished block 9. Well, it's almost finished. I still have to put in the grass. I thought I'd wait on that because I always end up snagging my straight stitches. After I finished the block I decided to get my Kind Fond Love Sampler back out. I forgot how much I love this sampler! 40 ct. Vintage Light Examplar, DMC threads (1 over 2). What a sweet gift from Andrea :) Beautiful stitching progress too. Have fun at your stitching getaway! OK, I love that sampler just with what you have done already. I have not seen this one before. I looked up the entire piece...OMG! I love it. I have to put it on my "want" list. Thank you for sharing! Have a great weekend. Those are beautiful WIPs. Have fun on your trip!!! Hi Nicole, so much to look at. I think I'm going to join you and Dona and start KFL. Congrats on your little guys finishing the school year on such a high note. 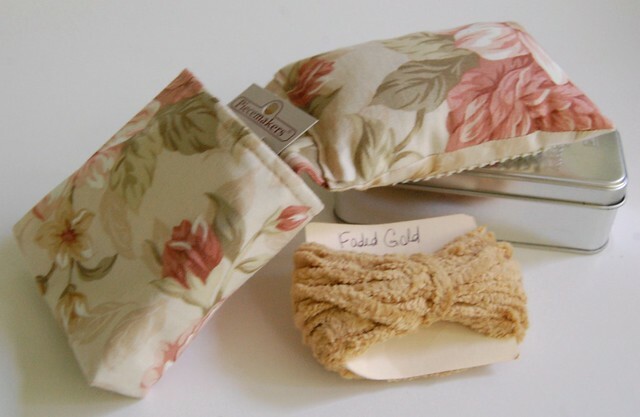 Look forward to stitching with you tomorrow! Kudos to your kiddies too. What a lovely gift. Congrats to your kids! I haven't seen KFL for a while - still amazing. Have fun in FL! Beautiful! I'm glad you got KFL back out again. What a sweet gift from Andrea too! What a cute gift from Andrea! Great wips! Congrats to your kiddos for finishing their school year on such a high note! I know you're so proud of them! Love your WIPS! I started on KFL and tossed it aside in favor of something else...but seeing yours makes me want to get it back out. 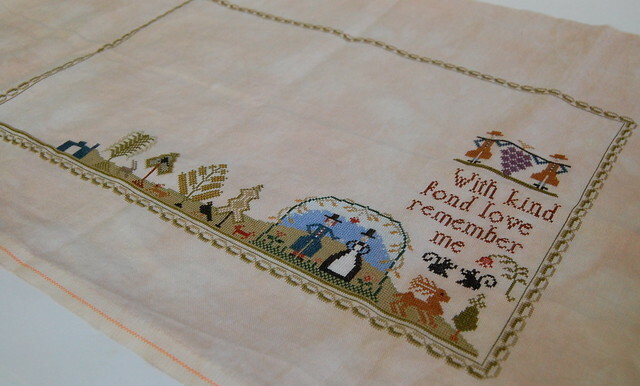 It is such a lovely sampler! Great WIPs Nicole!!! Oh I must say that my favorite is Kind Fond Love!!! I am going to have to get that chart. I'm glad to see you pulled out Village - I think that's my favorite one out of all of them, and I love, love your Brenda Keyes!! And congrats to your little ones for their grades and conduct. You should be one proud mom!! Hope you have a wonderful time with your friends!! Wonderful gift! Both WIPs are beautiful. Hae a great time in Florida. Beautiful WIPs! Nice pressie from Andrea too. Congrats to your two sons on their accomplishments as well. I bet you're proud of them! Have a great time in FL! Nice present from Andrea. Your WIPs look great. Congrats to your boys for doing so well in school. Enjoy your stitching day and your trip to Florida. Your stitching progress is wonderful. I love the VoHRH, and that block is really pretty. KFL is gorgeous, too. Have a safe journey to FLA and a great time while you're there! Fantastic that you dug out "Kind Fond Love". 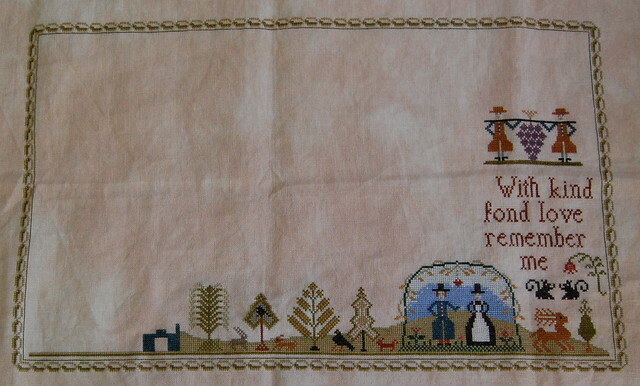 That's the sampler I found your blog when searching for pictures of it. And I LOVE seeing yours. Congrats with the results of your kids. It's always a great feeling when your kids are doing well at school isn't it? 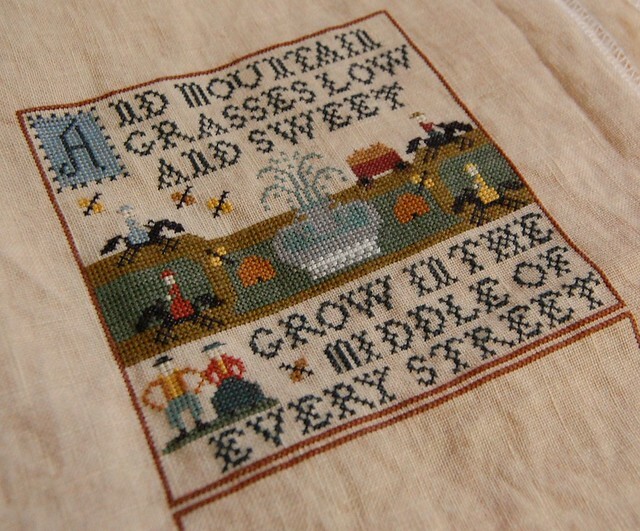 Beautiful progress on your stitching, it all looks lovely. Great little gift you got. I am totally in love with your KFL - so pretty. Your Villages is wonderful as well. Samplers look great, Nicole. I've just picked mine back up again since last week. Back to Mary Wigham, can you belive it?! Your progress looks great! Have fun in FL. Hopefully, the temps aren't too hot for enjoying the beach, etc. Congrats on finishing the block - very pretty, and so is the WIP. Wonderful progress on your WIPs. A lovely gift from Andrea too. What a sweet gift from Andrea!! I love your two samplers, too--great progress!